Need an escape but don’t want to harm the environment in the process? There are hotels throughout the world centered around sustainability – from a seaside resort in Thailand that grows 100% of its produce to a self-sustaining vacation spot in Mexico. Featuring beautiful design and eco-friendly accommodations, these hotels allow you to satisfy your wanderlust in a conscious way. Hit the jump to check out the eight green hotels we’ve rounded up, and get your adventure started. 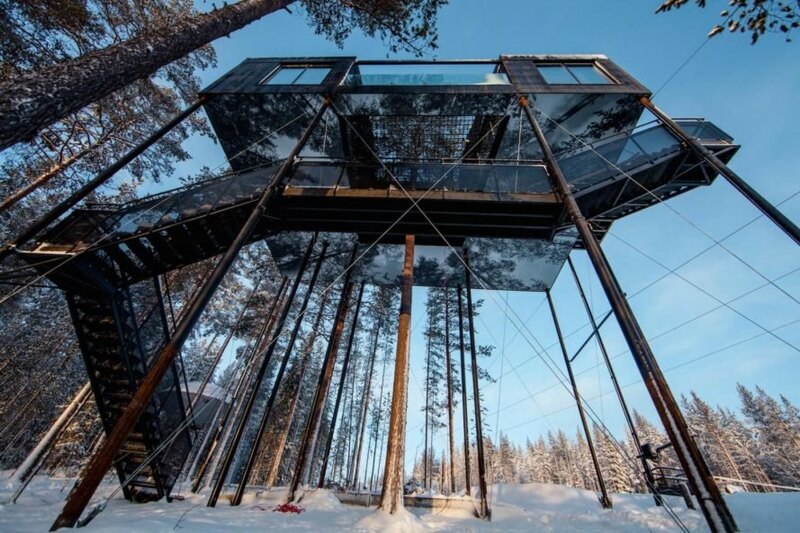 Treehotel, a collection of designer treehouses in Sweden, recently welcomed their 7th room designed by Snøhetta. The cabin is lifted over 30 feet above ground and immerses guests among the enveloping pine trees – Snøhetta said their goal was to bring nature and people closer together. Massive windows and skylights afford opportunities to gaze at the Northern Lights, and a pine tree print across the bottom of the cabin makes it appear invisible from underneath. 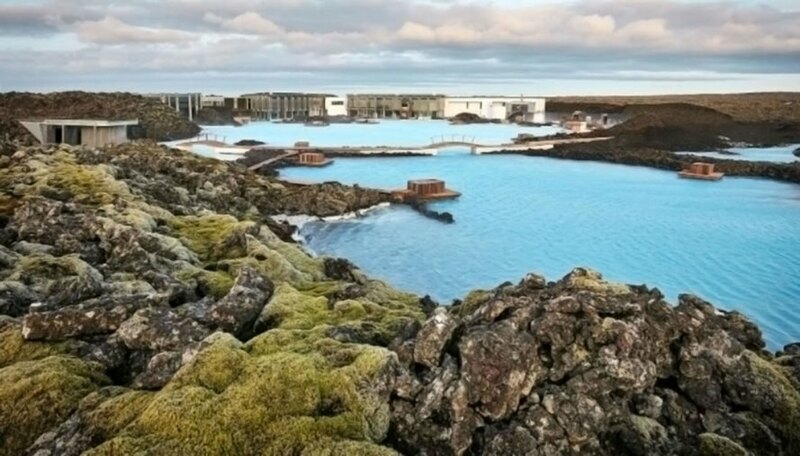 When you think of Iceland, you probably think of the famous Blue Lagoon, colored via minerals in waste – but safe! – seawater from a nearby geothermal plant. But you may not know there’s a new resort, the Moss Hotel, under construction there, perched near the pools. The resort design is meant to connect seamlessly with the landscape. Visitors can explore lava corridors and waterfalls in a subterranean spa, and a new restaurant will feature seasonal and local ingredients. The 62-room hotel will open this fall. 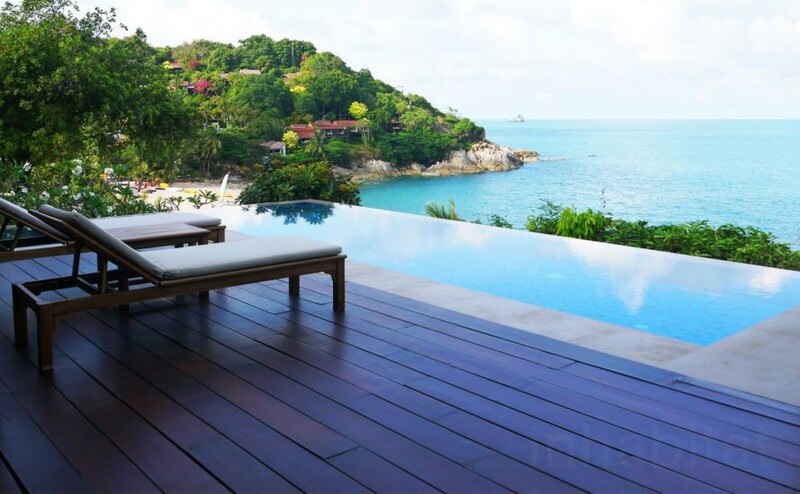 Traveling to Thailand? Look no further than The Tongsai Bay Hotel. The hotel was constructed with the environment in mind; not even one tree was cut down to make room for the family-owned resort. 66 species of birds and wildlife reside within the hotel’s 28 and a half acres. The resort also grows 100 percent of its produce, with food waste getting a second life as fertilizer. They practice radical reuse; a few examples include reusing old bathtubs as planters and old sheets as napkins. An old Singapore warehouse – that once acted as an opium den – got a second chance as the classy Warehouse Hotel. The waterfront warehouse is 121 years old, but Zarch Collaboratives gave it new life with a design inspired by its industrial past in 37 rooms and a double-height lobby. The hotel kept some original elements of the warehouse like its peaked roofs and renovated others like the louvre windows. Near Tulum, Mexico rests a self-sustaining, eco-luxe villa that’s the stuff of travel daydreams. The resort designed by Specht Architects is cooled in part by large cutouts in the walls and insulated with native plants adorning the roof. Solar-powered, the villa collects and filters rainwater for use. It even utilizes constructed wetlands for wastewater treatment. Not only does the hotel boast impressive sustainability but stunning bay views and gorgeous modern design as well. Brothers and artists Frank and Patrik Riklin took sleeping under the stars to a whole new level with their one-room, open-air hotel in Switzerland – with no walls or roof. Visitors to the second reincarnation of Null Stern (the first being a nuclear bunker turned luxury hotel) may not have access to a bathroom but do have a butler for the night who will bring breakfast in bed. The minimalist experience provides stunning views of the Swiss Alps. 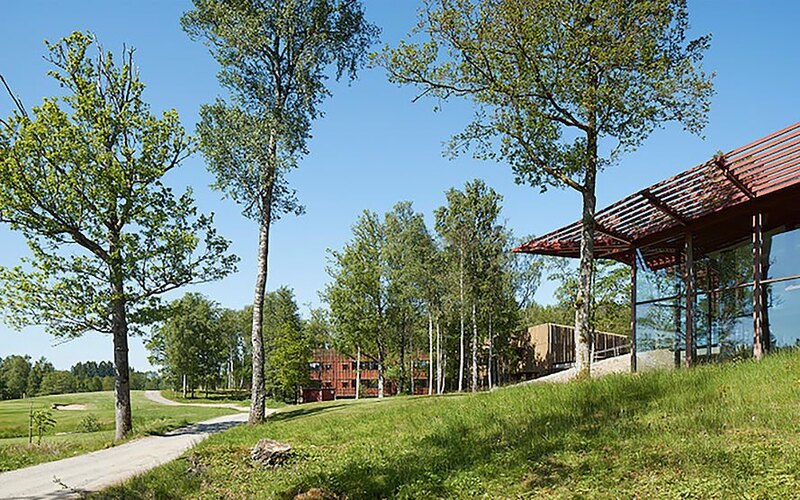 As you might guess, there’s more than one eco hotel in Sweden. Kjellgren Kaminsky Architecture designed Öijared Hotel with a similar aim of blending the buildings into surrounding nature. Locally sourced and natural materials were used in the hotel’s 34 prefabricated rooms. Natural wood materials inside add to the earthy aesthetic. 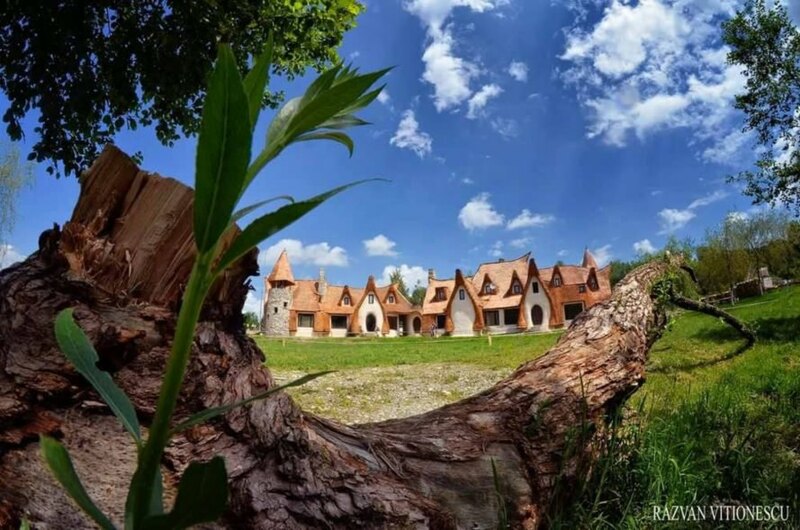 In Romania, a storybook hotel built of clay and sand, hearkens back to both ancient stories and ancient building techniques. The Castelul de Lut Valea Zanelor, designed by owners Razvan and Gabriela Vasile along with eco architect Ileana Mavrodin, includes 10 rooms and was constructed without drawing on any modern building techniques. Natural materials, shaped by local craftsmen, give the hotel a fairytale feel. Need an escape but don't want to harm the environment in the process? There are hotels throughout the world centered around sustainability - from a seaside resort in Thailand that grows 100% of its produce to a self-sustaining vacation spot in Mexico. Featuring beautiful design and eco-friendly accommodations, these hotels allow you to satisfy your wanderlust in a conscious way. Hit the jump to check out the eight green hotels we've rounded up, and get your adventure started. Blue Lagoon hotel connects with Icelandic landscape When you think of Iceland, you probably think of the famous Blue Lagoon, colored via minerals in waste - but safe! - seawater from a nearby geothermal plant. But you may not know there's a new resort, the Moss Hotel, under construction there, perched hear the pools. The resort design is meant to connect seamlessly with the landscape. Visitors can explore lava corridors and waterfalls in a subterranean spa, and a new restaurant will feature seasonal and local ingredients. The 62-room hotel will open this fall. Thailand resort grows 100 percent of its produce Traveling to Thailand? Look no further than The Tongsai Bay Hotel. The hotel was constructed with the environment in mind; not even one tree was cut down to make room for the family-owned resort. 66 species of birds and wildlife reside within the hotel's 28 and a half acres. The resort also grows 100 percent of its produce, with food waste getting a second life as fertilizer. They practice radical reuse; a few examples include reusing old bathtubs as planters and old sheets as napkins. 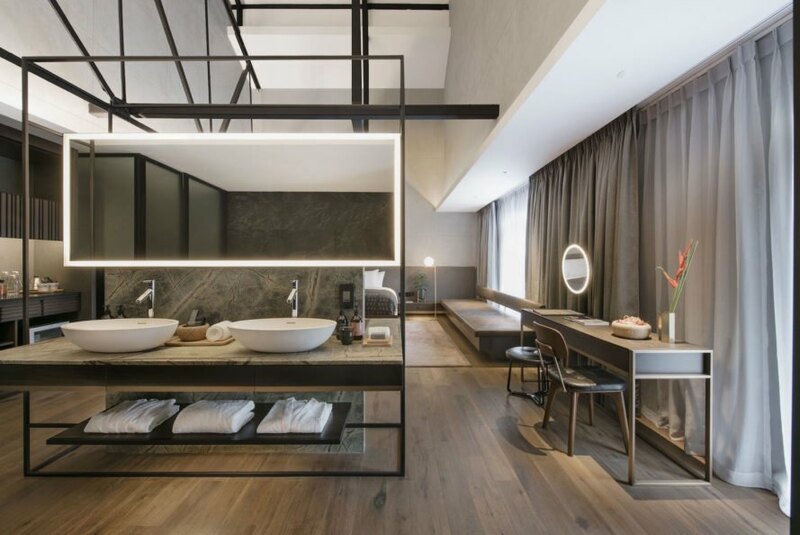 121-year-old warehouse on Singapore River given new life as chic hotel An old Singapore warehouse - that once acted as an opium den - got a second chance as the classy Warehouse Hotel. The waterfront warehouse is 121 years old, but Zarch Collaboratives gave it new life with a design inspired by its industrial past in 37 rooms and a double-height lobby. The hotel kept some original elements of the warehouse like its peaked roofs and renovated others like the louvre windows. 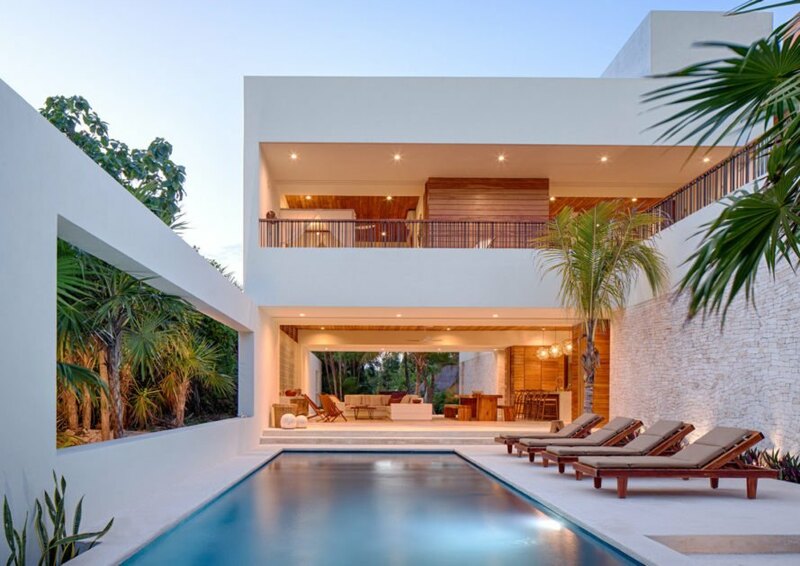 Self-sustaining Mexico resort incorporates permaculture principles Near Tulum, Mexico rests a self-sustaining, eco-luxe villa that's the stuff of travel daydreams. The resort designed by Specht Architects is cooled in part by large cutouts in the walls and insulated with native plants adorning the roof. Solar-powered, the villa collects and filters rainwater for use. It even utilizes constructed wetlands for wastewater treatment. Not only does the hotel boast impressive sustainability but stunning bay views and gorgeous modern design as well. 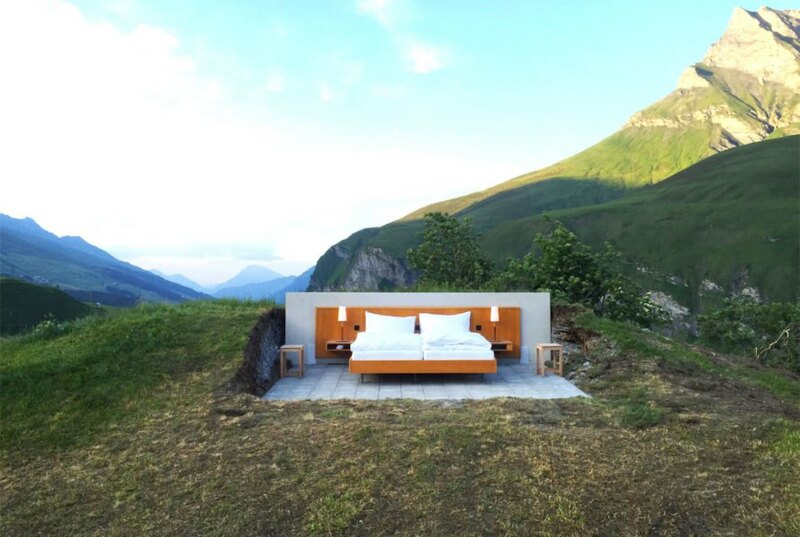 Switzerland visitors enjoy connection to nature in open-air hotel Brothers and artists Frank and Patrik Riklin took sleeping under the stars to a whole new level with their one-room, open-air hotel in Switzerland. With no walls or roof, visitors to the second reincarnation of Null Stern (the first being a nuclear bunker turned luxury hotel) may not have access to a bathroom but do have a butler for the night who will bring breakfast in bed. The minimalist experience provides stunning views of the Swiss Alps. Sweden's famed Treehotel welcomes Snøhetta-designed 7th room amidst the pines Treehotel, a collection of designer treehouses in Sweden, recently welcomed their 7th room designed by Snøhetta. The cabin is lifted over 30 feet above ground and immerses guests among the enveloping pine trees - Snøhetta said their goal was to bring nature and people closer together. Massive windows and skylights afford opportunities to gaze at the Northern Lights, and a pine tree print across the bottom of the cabin makes it appear invisible from underneath. Locally sourced, natural materials comprise spruce-clad Swedish hotel As you might guess, there's more than one eco hotel in Sweden. Kjellgren Kaminsky Architecture designed Öijared Hotel with a similar aim of blending the buildings into surrounding nature. Locally sourced and natural materials comprise the hotel, which includes 34 prefabricated rooms. Natural wood materials inside add to the earthy feel of the hotel. Whimsical hotel in Romania built with sand and clay In Romania, a storybook hotel built of clay and sand hearkens back to both ancient stories and ancient building techniques. The Castelul de Lut Valea Zanelor, designed by owners Razvan and Gabriela Vasile along with eco architect Ileana Mavrodin, includes 10 rooms and was constructed without drawing on any modern building techniques. Natural materials, shaped by local craftsmen, give the hotel a fairytale feel.